Look, I understand just how cool the Oculus Rift may seem to my tech nerd brothers and sisters. And I shouldn't judge something before I've tried it. But every time someone tells me how awesome this cutting-edge virtual reality technology is supposed to be, I can't help but see every old VR headset of the 1980s and 90s flash in front of my eyes. I'm doing my best to overcome my (many) biases against today's VR tech. And maybe finally strapping one on will do the trick, since my last VR-like experience was probably testing out the Nintendo Virtual Boy at my local Target almost 20 years ago. But there's something almost inherently retro-futuristic about virtual reality headgear. It feels like the wrong application for a technology that should be baked directly into our brains by now or something. This is the second decade of the 21st century, isn't it? Even if Oculus Rift is the absolute pinnacle of VR technology, it still looks like a goofy throwback. Anyways, here's a little visual sample of the retro-futuristic fever dream I experience every time I hear the words Oculus Rift ringing in my ears. Anheuser-Busch's virtual reality game at a food marketing expo in Chicago in 1993. A man trying out VR tech in the Sci-Fi Channel's booth at the 1993 National Cable Television convention in San Francisco. A marketing spokesman at VPL Research in Redwood City, demonstrating a VR simulation of driving a car in 1990. A group of people testing out the Vfx1 headgear at Comdex in Las Vegas in 1995. Newt Gingrich testing some virtual reality headgear at the "Cyber Suite" inside the Century Plaza Hotel in Los Angeles in 1996. A woman trying out the "Reality +" system at the Virtual Reality Systems show in New York in 1993. Visitors experience a "virtual reality performance" at the IAA in Frankfurt in 1997. A visitor tries out a VR headset to see the features of the Nissan Primera at the 1996 Paris Auto Show. Testing out a VR skiing program at the NEC Corp lab in Tokyo in 1992. The Duchess of York playing a Sega virtual reality game called "Space Mission" in London in 1996. People trying out the Dynovisor VR headset at the 1996 Tokyo Toy Show. Defense training applications are shown off at a 1997 military conference in Singapore. 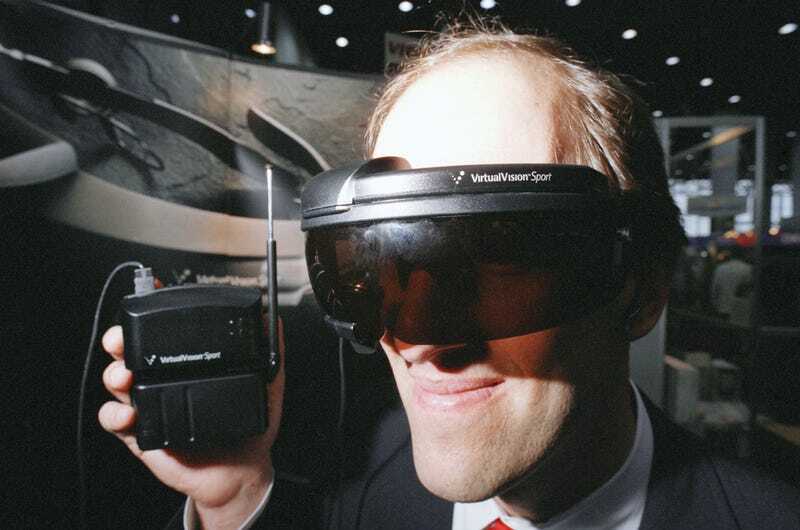 Visitors try out VR glasses at the 1995 International Electronic Fair in Berlin. A Toshiba employees wearing an enormous prototype headgear in 2006.